Letters to Elijah: Harvest Swap! Yahooo! I participated in my first blog swap! I joined in the fun from The Homespun Heart. We were matched up with another blogger. My partner was Ginger from One Day At Time. 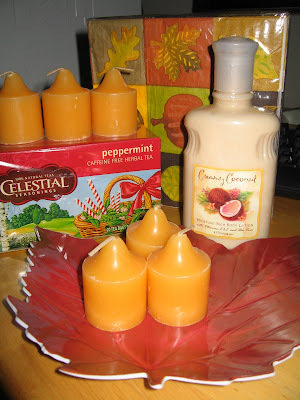 She showered me with wonderful goodies... yummy smelling candles, peppermint tea, creamy coconut body lotion, thanksgiving napkins, and a beautiful mapple leaf tray. Thanks so much Ginger! I wish I took a photo of the items I sent her - maybe she will post on her site.